I've mentioned in a couple of other Halloween-themed posts here about how this is Essley's first Halloween where she "gets it" and is therefore all sorts of excited. And that, in turn, makes me equally pumped. I'm telling you guys, there is nothing better this time of year than seeing a kid clap and squeal over the sight of a freaking jack o' lantern. It's really, really great. While we still haven't quite settled on a costume idea (we've got ten days and counting to get on it; yikes), I've paid lots of attention to other details - like getting pumpkins carved, planning a mini Halloween lunch, and getting her trick or treat bag ordered. I discovered so many seriously adorable treat bags at Gifts For You Now that take your average old pillow case bag up a major notch. 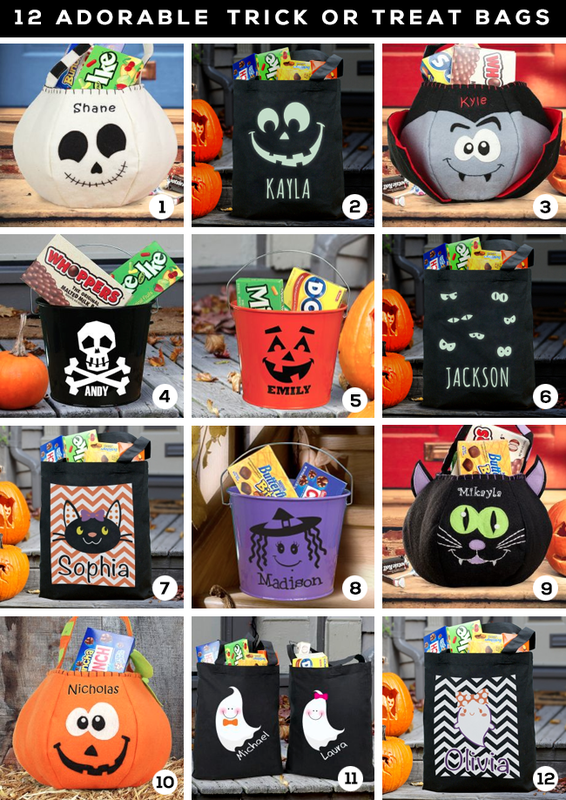 I mean, look at that skeleton bag (#1), or the skull bucket (#4). Could they possibly be any cuter? The fact that you can get them personalized basically took me over the edge of Halloween giddiness. I'm definitely over the top this year, but I'm cool with that. And I'm pretty sure Essley is too. This post is in collaboration with Gifts For You Now.